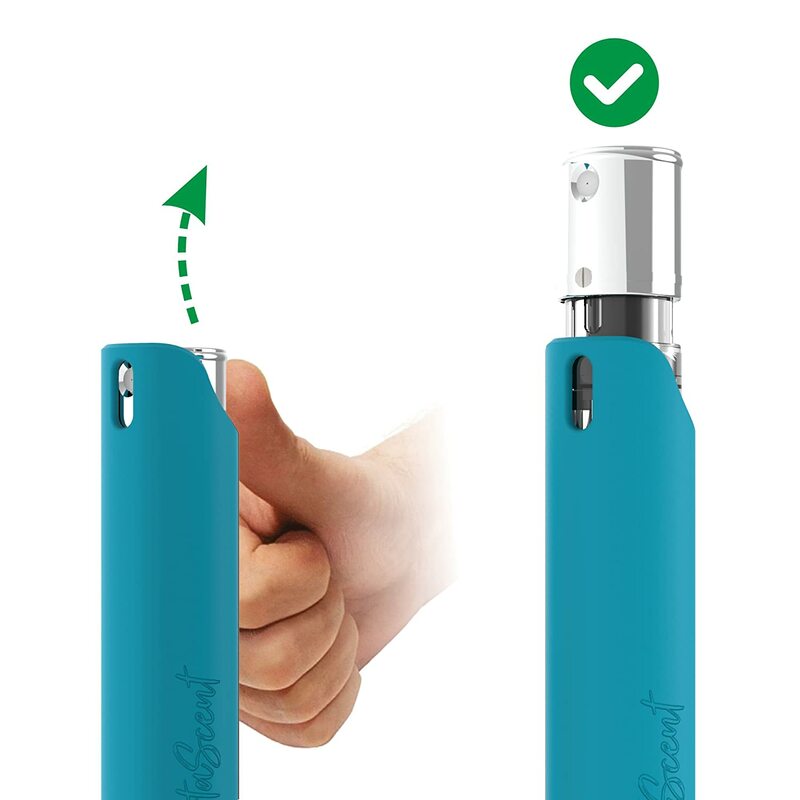 No Cap and a directional spray allow you to use it with one hand, and without searching for the spray direction every time you use it. Strong, light, Glass free and air travel approved for carry on luggage. 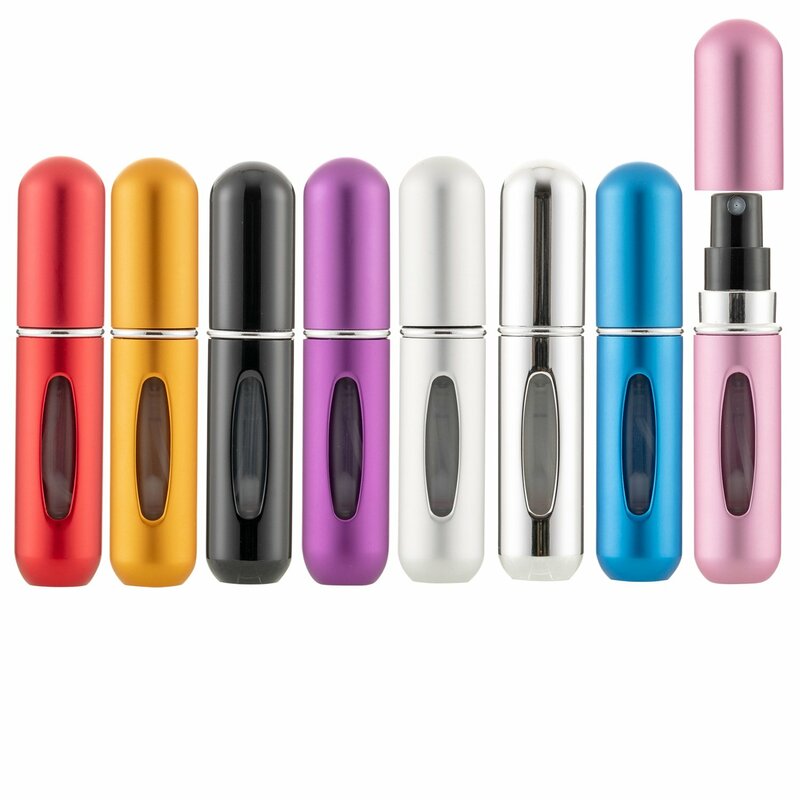 The perfect refillable perfume bottle for car, handbag, travel, gym and on the go freedom! 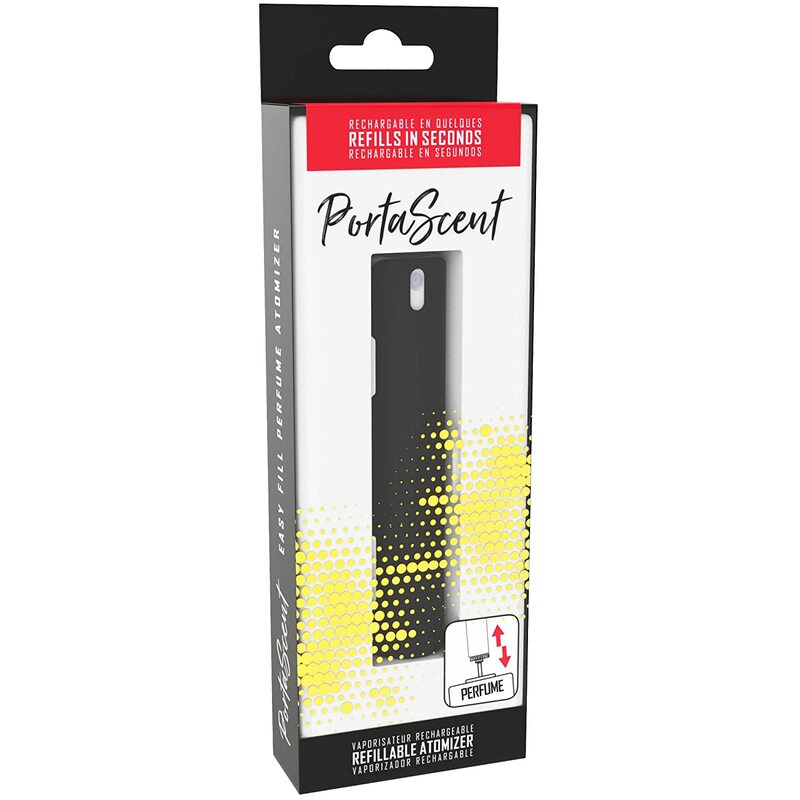 PortaScent is a travel size perfume atomiser spray bottle with a difference. 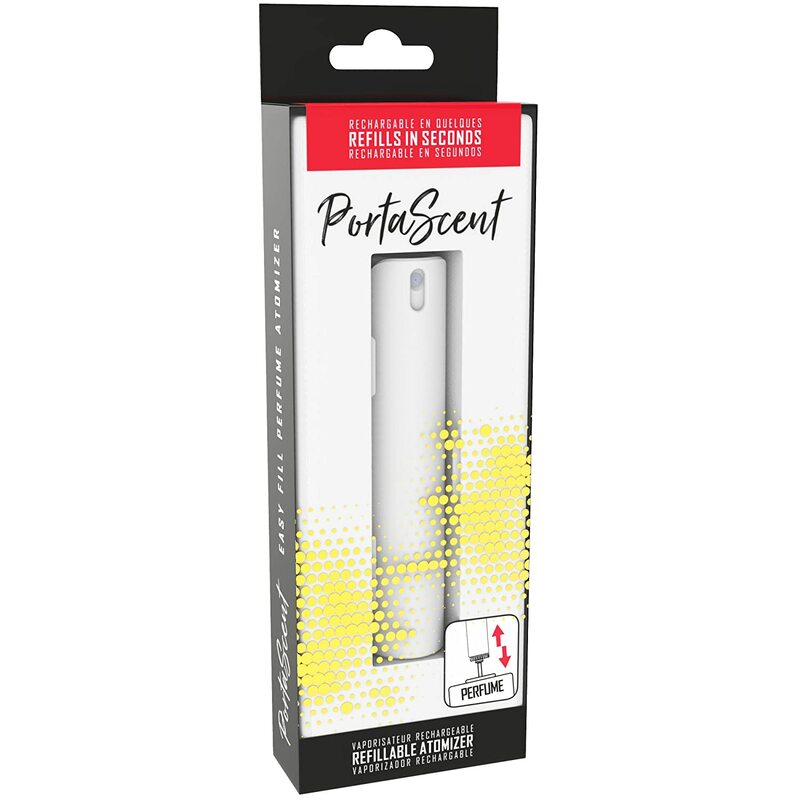 This refillable perfume spray has easy pump-to-fill technology for spill free refilling in seconds. PortaScent comes in two parts. The atomiser bottle, and the case. The PortaScent case protects the fragrance container, and has no hole in the bottom, keeping the filling mechanism safe from debris and dirt. The PortaScent fragrance container has a locking mechanism. 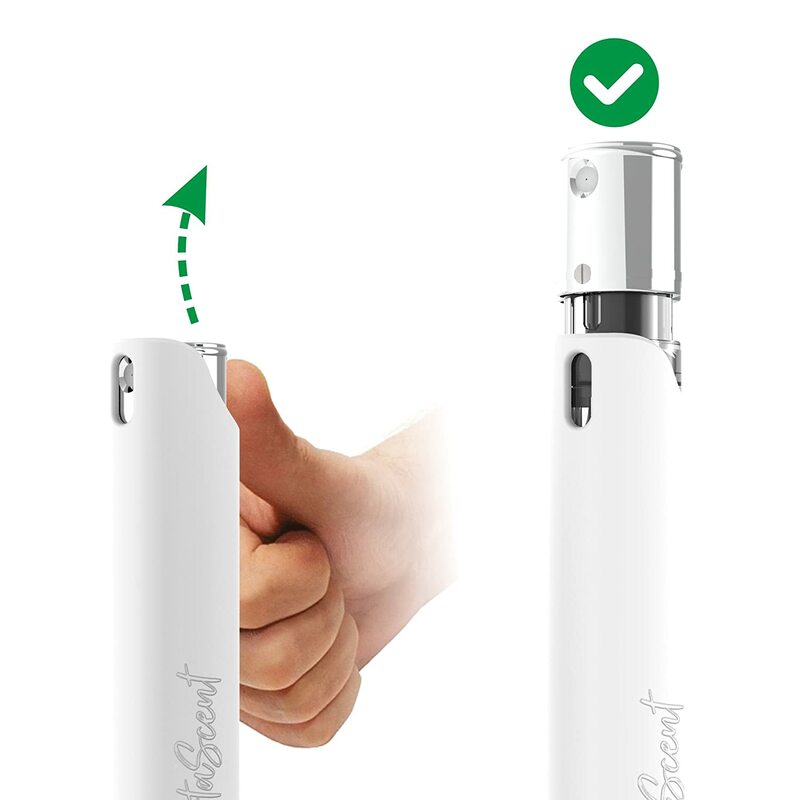 Simply rotate the base to unlock, refill with easy fill, and lock it closed again. No funnels, no mess, and no leaks! 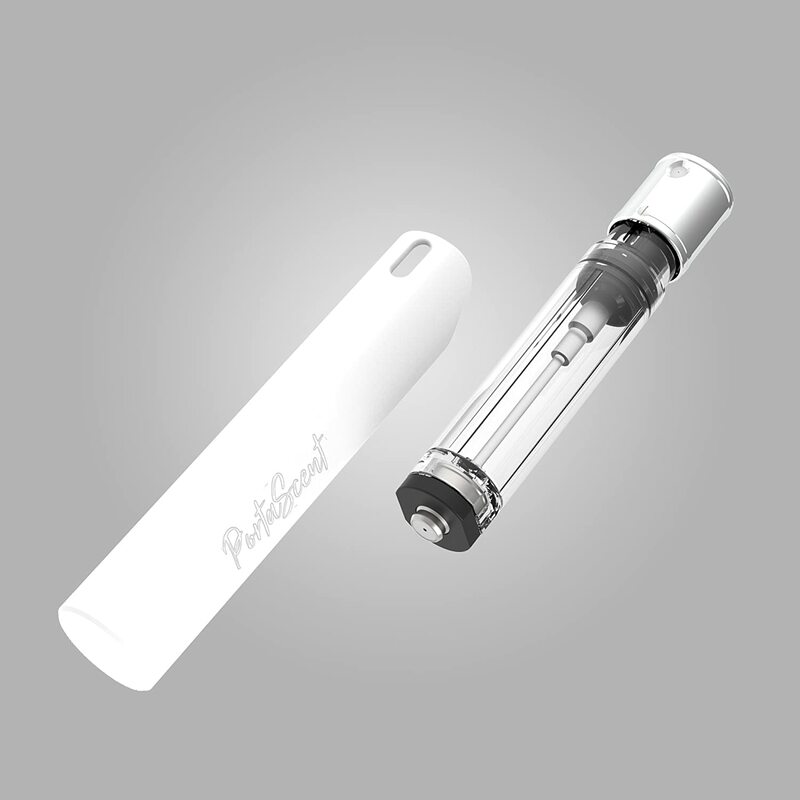 PortaScent does not have a removable cap to drop or lose, making it easy to use one handed. The fragrance container only goes into the case when it is locked, and facing the hole. 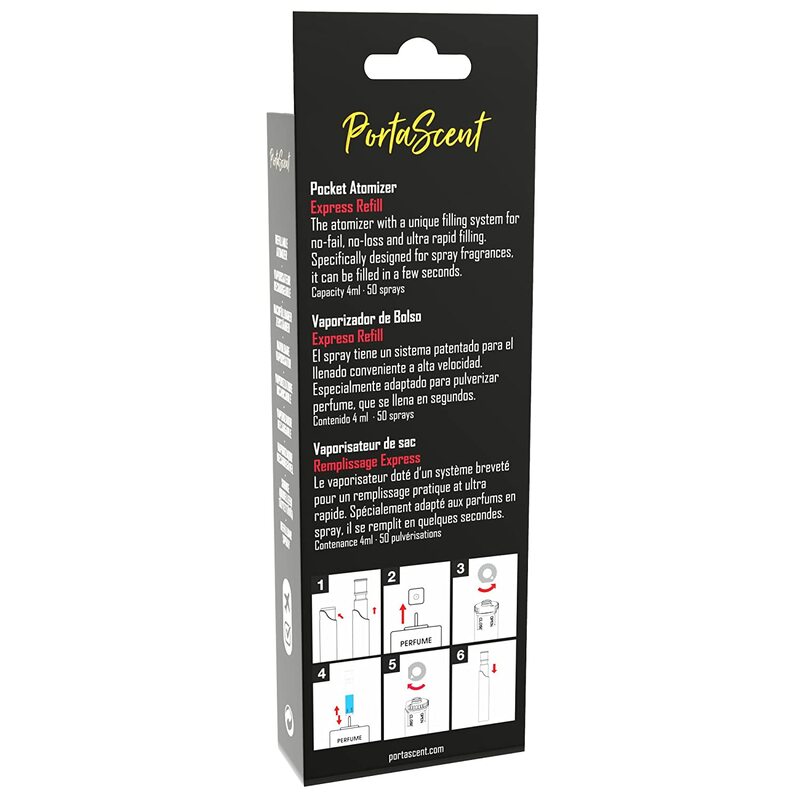 When you use it, you don't need to search for the spray hole - you can pull it out, direct it exactly where you want it, spray and put it away - all with one hand, slick and simple. 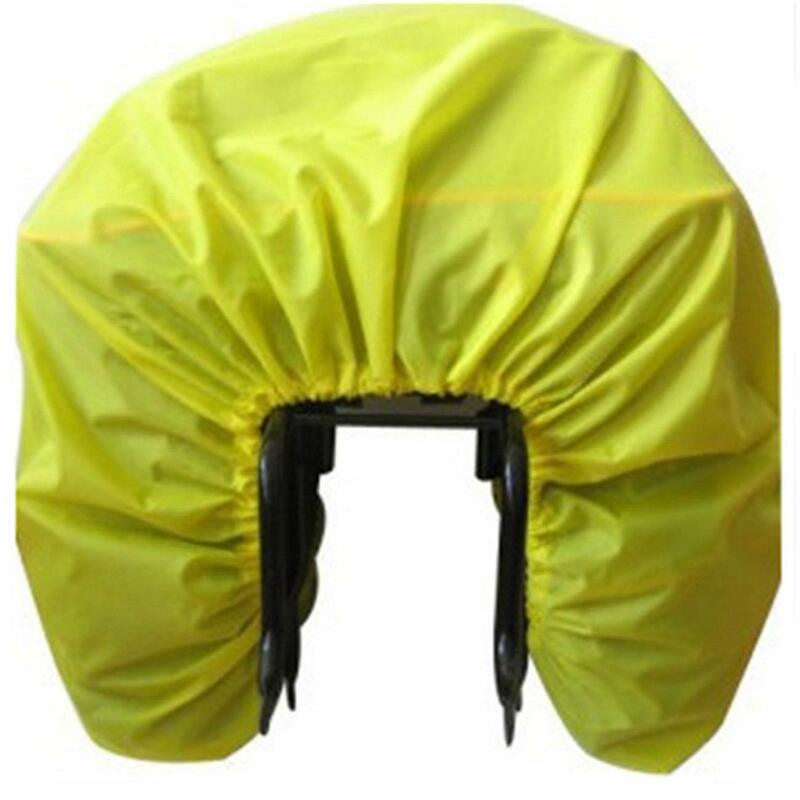 It is leak-proof, strong, light, glass free and air travel approved for carry on luggage. 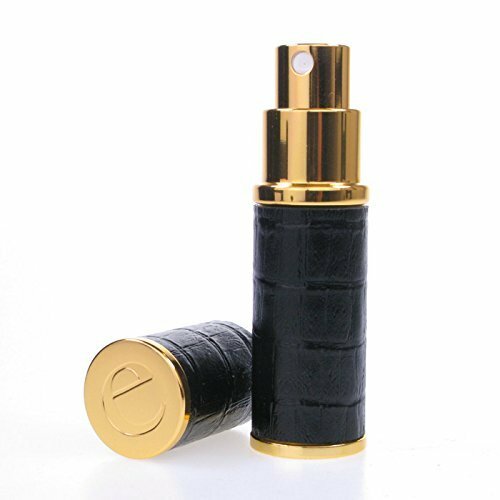 It is the perfect refillable perfume bottle for the car, handbag, travel, gym bag and on the go freedom. I rate this as one.of my best buys. Looks sleek and fits in my evening bag. Very easy to refill. Vv pleased with this. This is an excellent little fragrance dispenser, much better than I expected when I actually opened it given the very diminutive size. I had thought that this could not be large enough to contain much fragrance at all but upon using it (it attaches to any larger perfume bottle which had a press down nozzle dispenser and draws up the liquid before sealing shut again) there is a sufficient amount of fragrance portable with it. 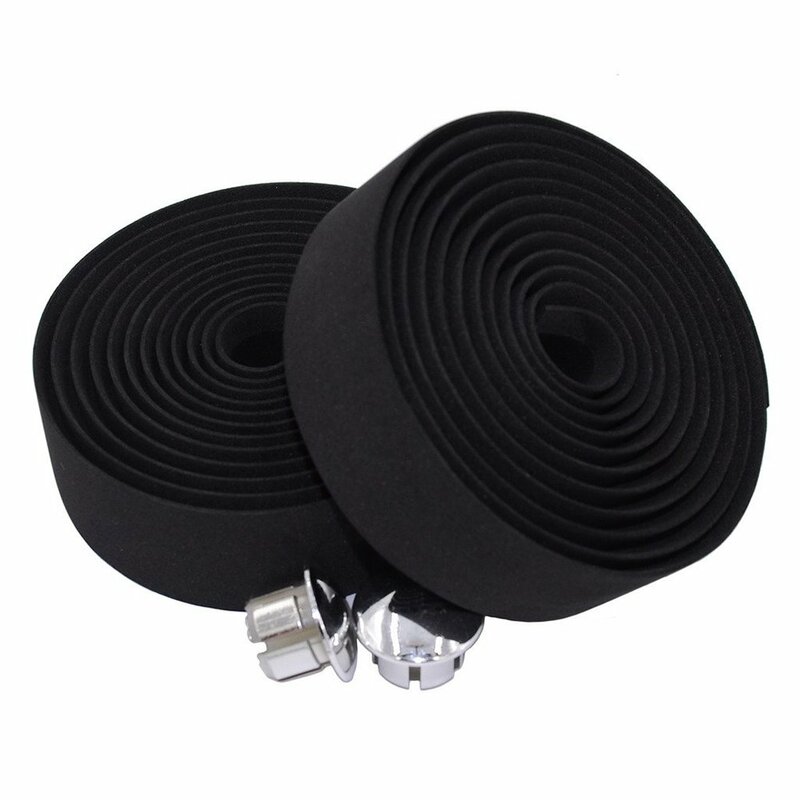 It will allow for continual topping up of a fragrance on a single night or day easily. 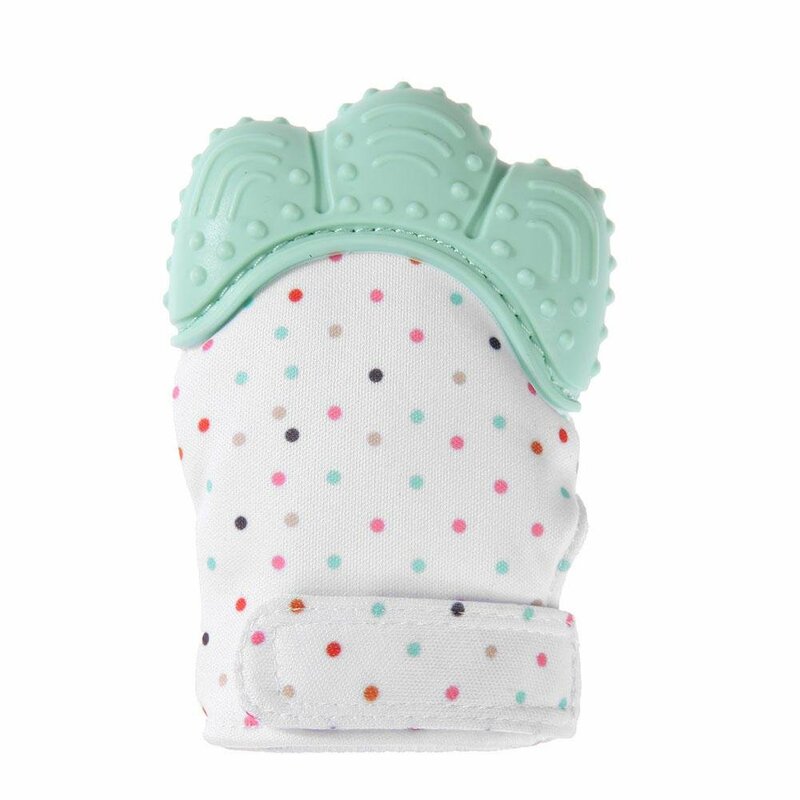 The build is good and I would not say that this would be liable to break in a purse, handbag, jacket pocket or shaving bag. It is actually larger/can carry more fragrance than smaller single use sample bottles or tubes of after shave that I have known to serve the same purpose for men and saves carrying larger, heavier, expensive bottles around for either men or women. There is a range of colours but the one I received was the relatively neutral white one. The internal bottle which fills is plastic and as another reviewer has stated this does make a difference if you are storing it for long, the glass bottles that perfumes are supplied in are not just a matter of being aesthetically pleasing, but I have not noticed to much a reaction when using this, either in the fragrance itself or the bottle becoming contaminated. It is easy to clear and use with a different fragrance from one to another occasion. 4.5 stars for this, rounded up to five. I've used several different types of mini atomiser sprays, some worked, some didn't, some were really tricky to fill, needing a mini funnel and three hands to avoid spills. This one simply works. Instructions are minimal, just some small line drawings on the outer box, so hopefully, these will help. The loss of half a star is because the silver metal-topped inner spray 'flask' clicks quite firmly into the outer white plastic spray holder, The only way to remove it from the holder, in my experience, is to grip it gently in your teeth, which isn't ideal. Gripping it in my fingers didn't work. 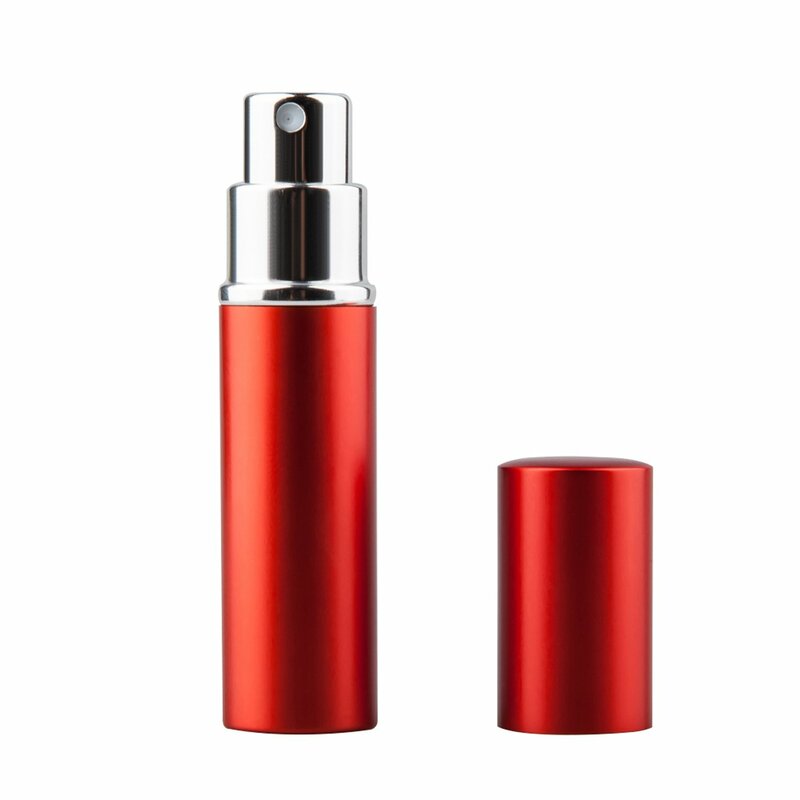 Once the inner flask is out, filling your spray with your favourite perfume is relatively simple. 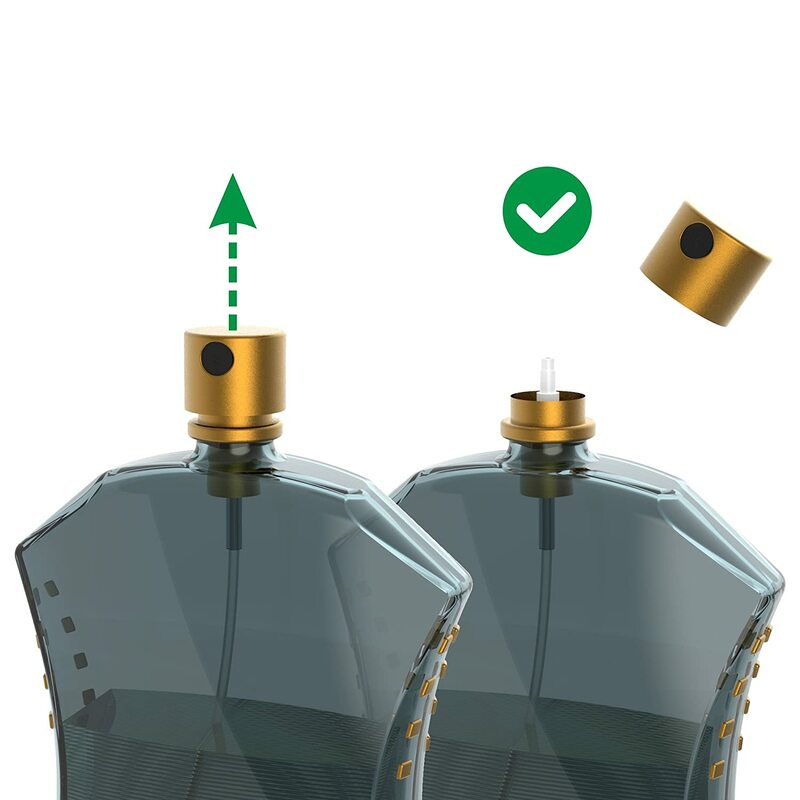 You need to remove the original spray head from your large perfume bottle to leave the plastic tube pointing upwards. 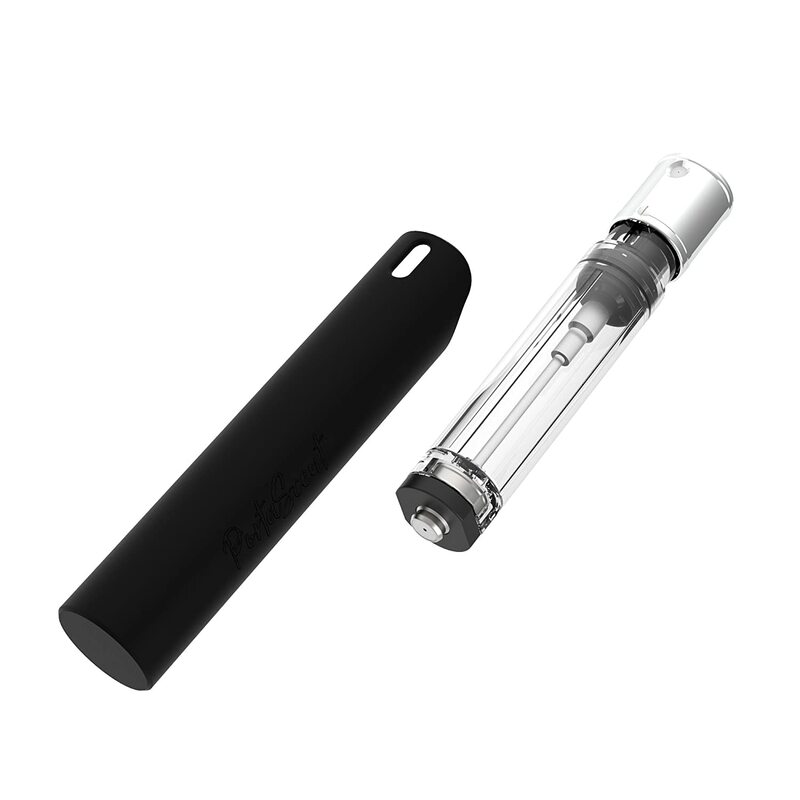 At the bottom of the clear inner plastic flask is a toothed grey plastic ring around a silver inner valve. 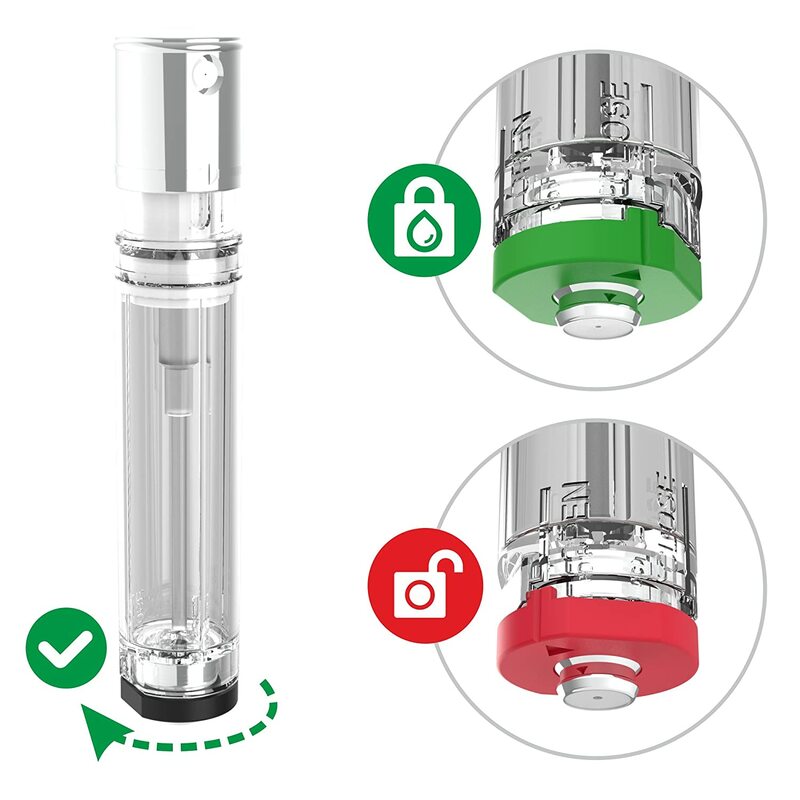 Turn the grey plastic ring in the direction indicated by 'Open - Close' on the front of the flask to open it ('Open' is to the left as you look at it, so it's anticlockwise when looking at the base of the flask. It won't turn the other way ). 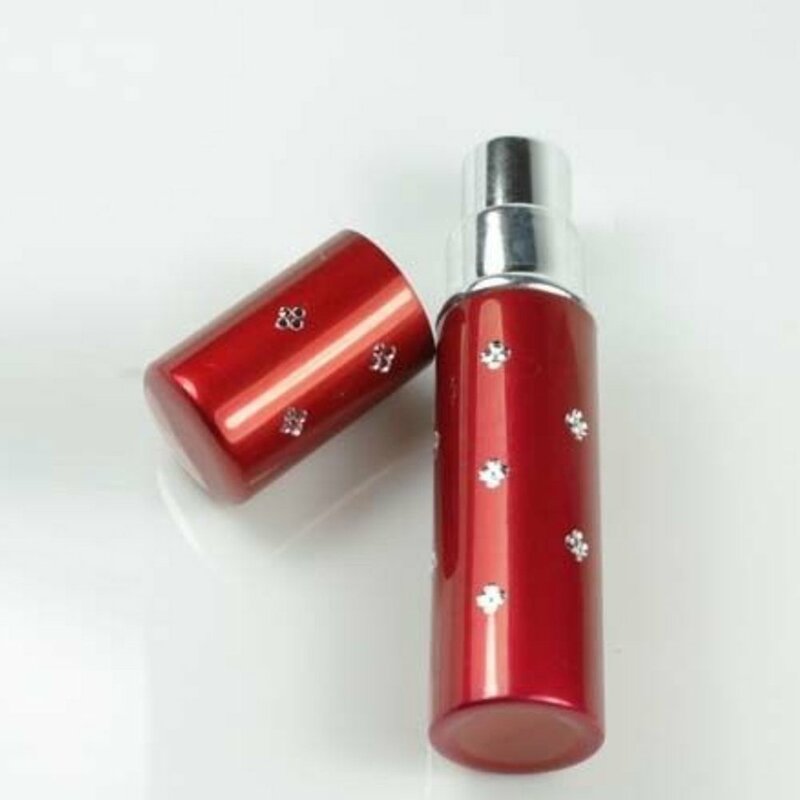 Then place the silver inner valve at the bottom of the 'flask' on top of the plastic spray tube on your large perfume bottle. Pump the spray gently on top of the bottle, as if you were spraying, and watch the flask fill, with each pump. Turn the grey plastic ring clockwise, to seal the valve shut, when the flask is full. 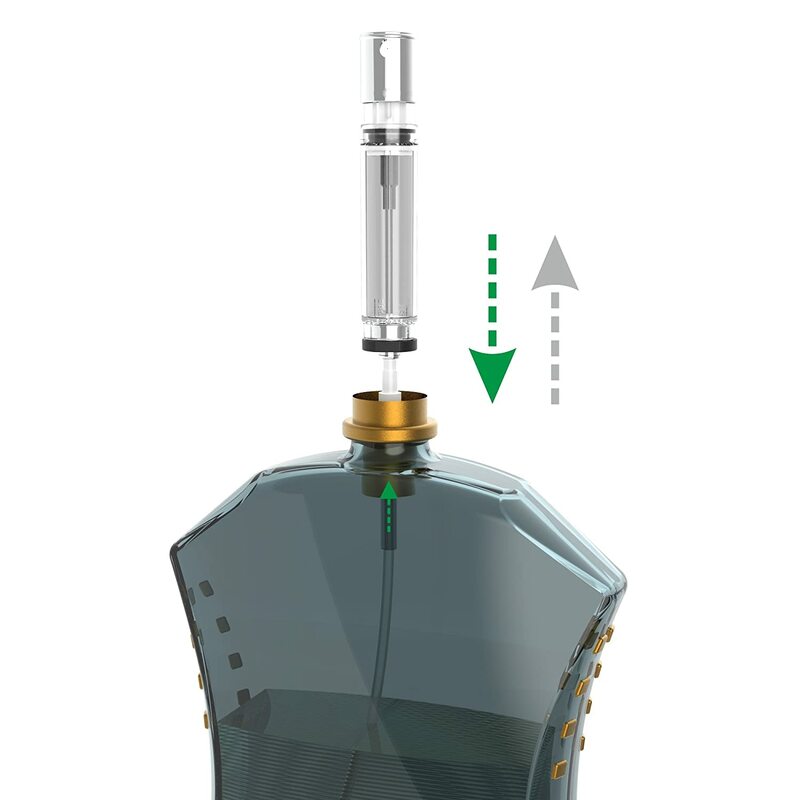 Click the clear plastic flask back into the white outer case, and spray. I did this, and not a drop was wasted of my perfume. My sister has taken a similar spray on internal flights with no problems. I already have one of these but with my other one you just depress the bottom of the bottle on top of a pressurised perfume container and it fills it up. You then remove it and it's done. This is slightly different, firstly you have to remove it from the container, then you have to open the seal where the perfume will go in, press it on to your pressurised perfume bottle, fill . Then remove and close the opening, then pop back in the carry case. To me this is faff that you don't really need. However, if you've never used one of these before this probably won't bother you. 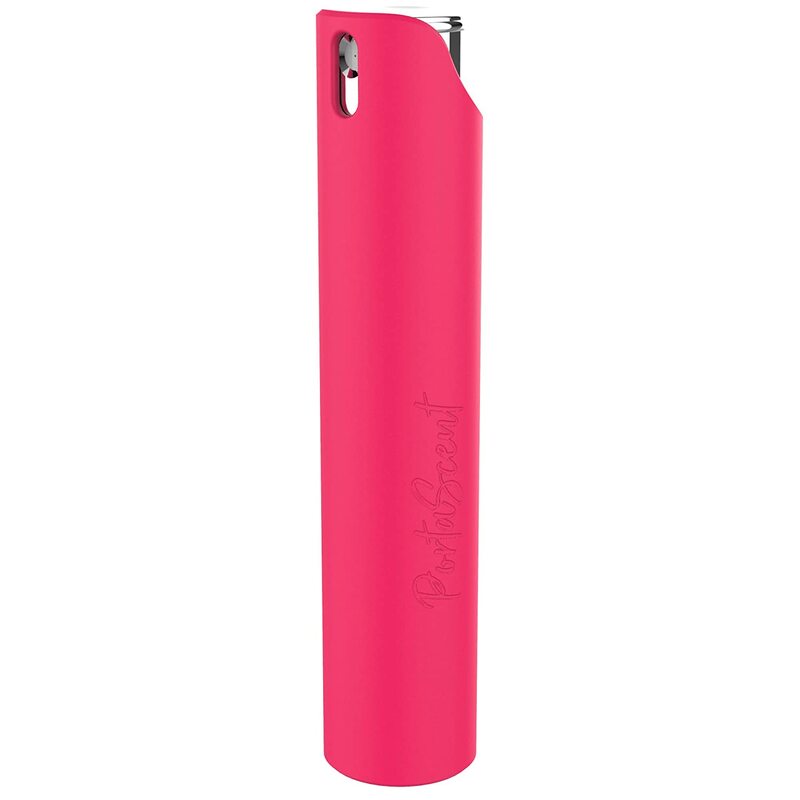 The container looks like a cheap disposable lighter. 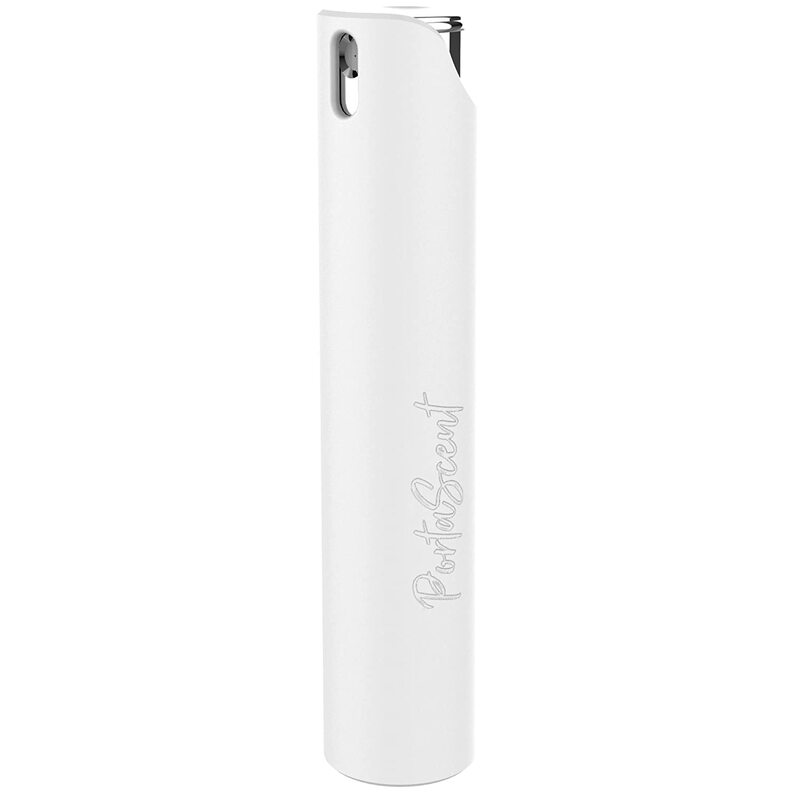 It has branding 'Portascent' lightly engraved on the side. Now I don't know about you but most women when they use perfume like to feel like they are being a little bit self indulgent. I speak for myself of course but when I spray a u00a365 perfume I want it to feel like a luxury even if I've transferred it to another container. This seriously misses the mark on that score because this does look cheap. In the past I've bought top end perfumes and several of these type of containers and filled them up with luxury perfumes, giving them as part of their Christmas or birthday gift. The recipients are usually thrilled to receive a little bottle of a premium brand in a luxurious looking mini spray, but as this looks quite cheap I definitely wouldn't be doing it with this. In terms of practicality this does work, and doesn't leak, but, makers: when a woman puts an expensive perfume into a container we want to retain that luxury feel. Although this works I probably would not buy this as a gift because it just looks cheap. Manufacturers, you need to remember that the perfume that goes inside this probably cost an arm and a leg. Most women do not want to put their expensive luxury perfume into something that looks cheap. 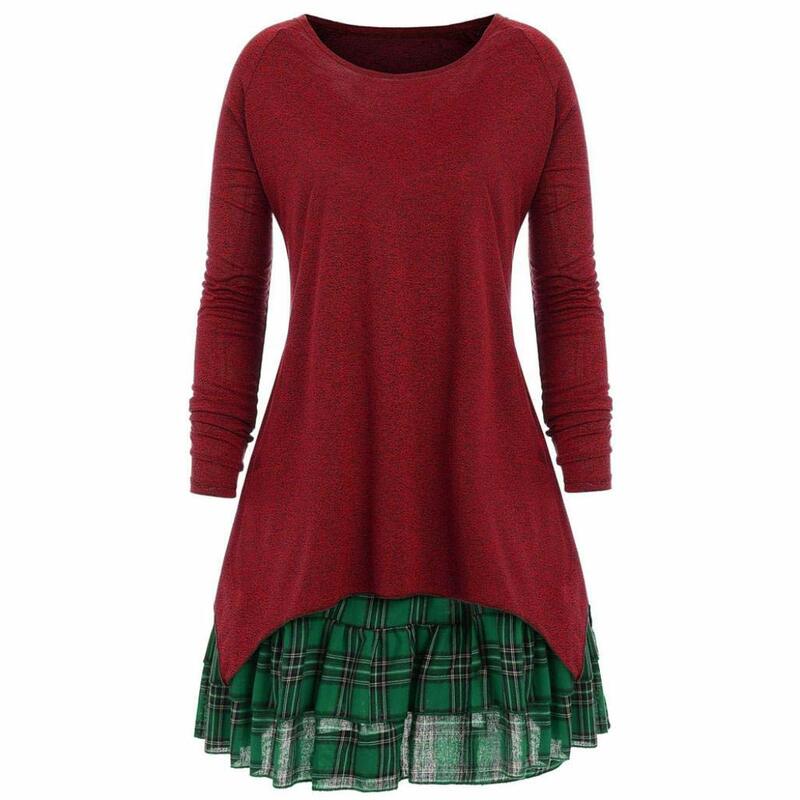 This needs a total redesign so that it looks more classy.